Flat Sheet There are 37 products. Flat bed sheet (for a 1 person bed) 180x290 cm + 1 pillowcase 65x65 cm, 100% pure cotton, long fiber, embroidered percale. 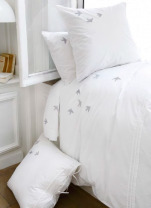 White bed sheet and pillowcase with embroidered swallows and wrinkles. Swallows colors: gray to beige trend. Pillowcase tie with 3 links. Tight weave. Red pourpre cashmere set including 1 flat bed sheet 270x310 and 2 square pillowcase of 65x65 cm assorted. Flat bed sheet with one side cashmere design. Pillowcases with cashmere designs on both sides with red bee, flat flying pillowcases. Set in 100% cotton percale, 80 thread/m², easy ironing, with color printing: red, burgundy pink, brown, black and ivory. Flat bed sheet + pillowcases pink flowers on light gray background 100% cotton printed percale. Square pillowcases and rectangles matched to the duvet cover finished with flat ruffle and gray piping. Washable 60°C. Extra ironing, easy care. Flat bed sheet + 2 pillowcases with gray and white lines 100% cotton flannel. Flat bed sheet with large gray lines and small white lines. Reversible pillowcase: one side with large gray lines and small white lines, the other side with large white lines and small gray lines. The material and weave provides softness and good insulation against cold winter. Flat bed sheet + 2 pillowcase beige flowers and leaves 100% cotton flannel. Flat bed sheet with matching framed pillowcase drawing beige flowers and leaves. The material and weave provides softness and good insulation against cold winter.